By Rick “Doc” Doggett, CAP 2-7-2, 1970-71I didn’t know Kenneth Whitmer, but I heard a lot of good things about him from the old timers when I first arrived at CAP 2-7-2. He was a former actual of 2-7-2, replaced by a sergeant who was killed and replaced in turn by Sgt. Alvin Burd. It seems strange to be writing this since I never met Whitmer, but somehow it is appropriate since I was intimately involved in his death. From left, LCpl. Latham, Sgt. Kenneth Whitmer, LCpl. Mike Bowles at the 1969 Marine Corps birthday party at CACO 2-7. The CACO 2-7 commander at the time did not, I believe, trust the CAP commanders and often overruled them. In addition, he had no idea about operational or morale issues in the CAPs. During firefights at CAP 2-7-2, he radioed orders to Sgt. Burd on how to engage the enemy and deploy our unit.Several times during firefights the CO ordered us to break contact, move to another location, then re-engage the enemy. That maneuver was probably right out of the Marine Officers Guide, and it might have worked if we were a company or battalion of line grunts. It was suicide for a CAP since it would have meant moving across open ground in the moonlight, under fire, and then trying to re-engage an enemy so elusive we rarely found them in the first place. I guess it never occurred to the CO that the VC could also move, slipping away in the dark. I remember Sgt. Burd arguing against those orders with the CO on the radio, then saying, “Roger that,” and hanging up. Burd waited five or 10 minutes and radioed back saying we were in our new position and trying to re-establish contact. We never moved an inch and were in contact the whole time, so re-establishing was easy. I credit Sgt. Burd with keeping us alive a few times by disregarding the orders of a CO who was several miles away. One of the reasons we lacked faith in the CO was his lack of care for our welfare. Maybe it wasn’t his fault, but as CO he was ultimately responsible. CAPs offered few creature comforts except those we carried on our backs, or scrounged from the ville. We heard that CAPs in other companies got hot chow on a regular basis and weekly Sundry Packages with cigarettes, soap, writing supplies, toothpaste and other items. SP packs were rare in 7th Company at that time. Likewise, we did not get daily supplies of treated drinking water, nor anything in addition to our three C-ration meals each day. As a result, most of us had some type of diarrheal disease and had a hard time keeping weight on. I lost 20 pounds in my first three months in the CAP, down to a skin-and-bones 125. When the next CO arrived we found that we were supposed to be getting those things, but the CACO 2-7 supply sergeant had been selling them on the black market. The supply sergeant was court-martialed. Sgt. Whitmer and I were caught up by this dysfunctional command structure. Whitmer had arrived in Vietnam in February, 1968, and extended his tour twice. By all accounts he was one hell of a fine Marine, displaying all of the intelligence, courage and experience you would expect of someone with his combat time. Mike Kubina said Whitmer taught him a great deal about being a CAP Marine, and Mike’s high regard was enough recommendation for the rest of us. Longtime CAP 2-7-2 member Paul Jungel also had a high opinion of his friend Sgt. Whitmer. According to Jungel, Sgt. 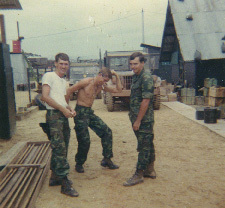 Whitmer learned many valuable lessons during his tours in Vietnam. It was early evening on March 24, 1970, and we were preparing to move out for the night when one of the village kids came looking for me. There was a sick baby in bad shape at Dum Dum’s house on the northern edge of the main ville. Although dusk was rapidly approaching, Sgt. Burd and another Marine went with me to check out the situation. As I entered the bamboo-walled house, I was startled to find it full of smoke. The villagers had built a fire on the floor and were using the smoke as some kind of treatment for the baby. I don’t think it was doing any good. The papa-san of the house was holding the 4- to 6-month-old infant on his lap and fanning her face. The baby was having a grand mal seizure and looked blue. After a moment the seizure stopped and the baby began breathing again, only to start seizing again a few minutes later. After observing a couple of cycles of seizing and turning blue, I decided I was way out of my league and the baby needed help at one of the hospitals in Danang. I told Sgt. Burd we should medevac the kid ASAP. After all, weren’t we there to help the people? Sgt. Burd accepted my evaluation and radioed CACO for a Dustoff. A short time later, a jeep came racing down Highway 1. Gary Omey was driving and Ray St. Germain was beside him in the “shotgun” seat. Sgt. Whitmer rode in back. According to St. Germain, all three were “short” but volunteered for the medevac. Ray St. Germain’s account of the ambushWe loaded the baby and her father onto the jeep and they sped off up the road back to CACO 2-7. A few minutes later we heard the sound of explosions and gunfire from up the road. Then we listened on the radio as a medevac chopper was called for the wounded. Then all was quiet until the CO radioed CAP 2-7-2 and asked for the actual. The pain and anger in Sgt. Burd’s eyes told me that if the CO had been there, Sgt. Burd would have killed him without another thought. According to St. Germain, the medevac jeep was approaching CACO 2-7 headquarters when the VC opened fire. Omey and Whitmer were hit hard, but St. Germain had only minor wounds, so he traded places with Omey and drove the rest of the way to CACO 2-7. The sick baby and the father were not wounded. If the Dustoff chopper had landed at our position, they would have been gone before Charlie had time to react. As it was, Charlie saw the jeep go down the road and guessed it would soon be coming back. The VC had all the time they needed to set up their ambush. The CO was later medevaced after his jeep overturned one day on Highway 1 where it passed through our ville. He was in intense pain as we loaded him onto the Dustoff, and I think his back was broken. Later, I realized it had never occurred to me to give him any morphine.